Why use Water fed pole system? Our new service is designed for all customers in commercial or domestic properties, our system will bring you brilliant results every time. Using 100% pure water the dirt just slides off your frames and sills leaving a streak and smear free result, in this process no detergents or chemicals are used making it very environmentally friendly. Not only do you get this superior quality but there are no ladders required reducing the risk of accidental damage to your property or our staff. 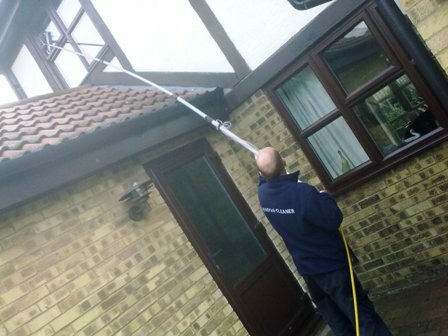 With water fed pole system we can reach most windows inaccessible by ladders reducing disturbance and maintaining privacy. Click below to see more pictures of our work using the Water Fed Pole system.